I bet you have been wondering, where does all that lovely beeswax come from? Right there. There are eight glands on the abdomen of the young worker bee that secrete wax when temperature conditions are right. Fun fact, to yield one pound of beeswax, the bees consume nearly eight pounds of honey. Bees are amazing creatures and will travel over 60,000 kilometers and pollinate over 2 million flowers to produce less than 1 pound of pure beeswax. That is why it is so precious. Beeswax is secreted by the wax-bees. They use it to build honeycombs. 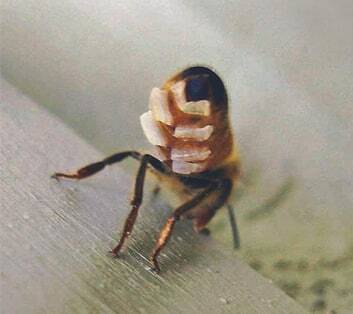 The wax is made from transparent and white scales that appear at the opening of the four small pockets on each side of the abdomen of the bee. Beeswax is recovered by melting by beekeepers, sometimes by means of a solar furnace. 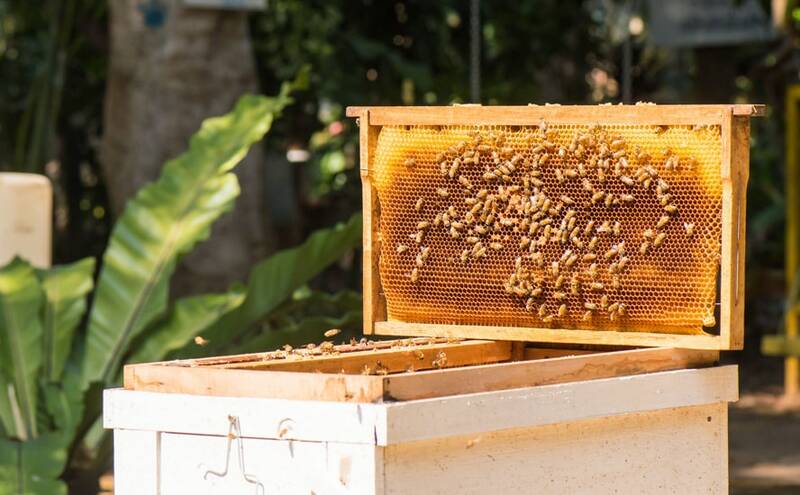 For beekeeping, it is assigned to an “embosser” which will turn it into preprinted cells which invite the bees in the hive to rebuild their shelves inside movable frames. – by the cosmetic industry for beauty products like creams, lotions, ointments and lipsticks. It is also used in the manufacture of medicines, candles and sometimes waterproofing and maintenance of certain materials such as wood, leather and even metal treatment. – it is also authorized as a food additive (E901). Its hydrophobic and antibacterial properties were one of the main ingredients of mummification by embalmers of ancient Egypt. – to treat animals with split hooves. In Asia and Africa, beeswax used to dye batik fabrics. – in the manufacture of didgeridoos. Beeswax can be stored a very long time. Its transformation is simple, a method of heating and filtering enough to prepare the wax, which can be sold in small pieces without special protection. – A melting point of 63°C. Beeswax emits negative ions when burned or diffused which are scientifically proven to clean your air of dust, mold and pollen, pet dander, smoke, odours and even bacteria and viruses. – Beeswax has been described as the most recalcitrant substance known to man which means it makes great, long lasting polish but is not so great to splash it on your clothes. – Approximately 4lbs of honey is consumed to produce 1lb of wax. – The natural colour of beeswax is yellow – all shades of yellow depending on forage but if it is brownish or olive it has been overheated. If it is pure white it has been bleached. Most bee species are reclusive and solitary; however, the honeybee (Apis mellifera) is highly social. They are the species most commonly raised by people for honey and their pollination services. – A queen bee will lay 1,500 eggs per day, or 225,000 per breeding season. – Worker-bees perform age-based tasks, from cleaning the hive to foraging for food. These bees die when they sting. – Drones have one task: to mate with a young queen. At the end of the season, drones are pushed out of the hive by the worker-bees. Drones do not have stingers. – When a bee swarm is seeking a new home, a few hundred worker bees will scout out new locations. Each bee returns to the swarm and advocates their find by dancing. The entire swarm joins the “discussion,” makes a decision, and flies to the new home. – Bees are often confused with wasps. Wasps are carnivorous hunters and are aggressive in nature while honeybees are strict vegetarians deriving their nutrition from pollens and nectar. Honeybees are generally not attracted to food and garbage containers near barbeques and picnic sites. – A swarm of bees looks frightening, though bees are not aggressive at this stage in their life cycle. Bees are more docile in a swarm than when they are in a hive because they do not need to protect the hive. Swarms generally move on to their new hive within a day or two. – “Killer Bees” (Africanized Honey Bees) are much more aggressive than regular honeybees. There have been no reports of these bees in Canada. Each bee adds only a tiny part to a given area of comb. Yet each cell ends up the same size and shape as all the others. From the apparent disorganization and haphazard chaos of work on the combs comes the perfection of uniformity. When you see the work going on it even looks as if each bee constitutes herself an inspection party of one. She looks the work over, gives it a pat here and there and goes on about her business. With thousands of bees doing this, you somehow get that perfect finished product.